The North Korean situation could spiral out of control, Russia has warned, after another day of inflamed rhetoric from Pyongyang. Russian Foreign Minister Sergei Lavrov warned of a "vicious circle" and told all sides to avoid unilateral action. 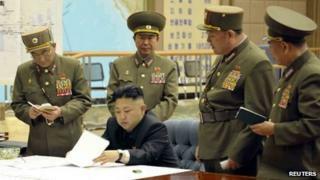 On Thursday, the North threatened to "settle accounts" and said it had put missiles on stand-by to hit the US. The US, which flew stealth bombers over South Korea this month, condemned the North's "bellicose rhetoric". White House spokesman Josh Earnest said the rhetoric only deepened North Korea's isolation. North Korean state media reported leader Kim Jong-un "judged the time has come to settle accounts with the US imperialists". Bluff has long played a fundamental role in North Korean strategy. The regime in Pyongyang needs its much more powerful neighbours and antagonists to take its threats seriously. By threatening potential chaos and war in the heart of the world's most dynamic economic region, it has in the past been able to transcend its own weakness and extract diplomatic concessions. But the United States may be about to call North Korea's bluff. The US treasury department is taking steps to squeeze North Korea financially, and the Pentagon has flown B-52 and B-2 bombers over the Korean peninsula - moves that are guaranteed to provoke a hostile reaction. Washington's tough stance presents Kim Jong-un with a dilemma. He wants to show his generals and the North Korean people that he can force concessions from the United States - in the same style as his father and grandfather. He could now be tempted to take brinkmanship to a new level, to try to convince the US and the region that confrontation does not work and carries too many risks. He was said to have condemned US B-2 bomber sorties over South Korea as a "reckless phase" that represented an "ultimatum that they will ignite a nuclear war at any cost on the Korean Peninsula". US mainland and bases in Hawaii, Guam and South Korea were all named as potential targets. North Korea's most advanced missiles are thought to be able to reach Alaska, but not the rest of the US mainland. State media in the North showed thousands of soldiers and students at a mass rally in Pyongyang supporting of Kim Jong-un's announcement. China, North Korea's biggest trading partner, immediately reiterated its call for all sides to ease tensions. Foreign Ministry spokesman Hong Lei told a daily news conference that "joint efforts" should be made to turn around a "tense situation". He made similar remarks on Tuesday. Russian Foreign Minister Lavrov went further, voicing concern that "we may simply let the situation slip out of our control and it will slide into a spiral of a vicious circle". "We are concerned that... unilateral action is being taken around North Korea that is increasing military activity," he said. In an earlier statement, the US military said that the B-2 stealth bombers demonstrated America's ability to "provide extended deterrence" to its allies and conduct "long-range, precision strikes quickly and at will". "The North Koreans have to understand that what they're doing is very dangerous," US Defence Secretary Chuck Hagel told reporters on Thursday. "We must make clear that these provocations by the North are taken by us very seriously and we'll respond to that." The US had already flown nuclear-capable B-52 bombers over South Korea earlier this month, in what it called a response to escalating North Korean threats. Tensions in the Korean peninsula have been high since North Korea's third nuclear test on 12 February, which led to the imposition of fresh sanctions. On 16 March, North Korea warned of attacks against South Korea's border islands, and advised residents to leave the islands. In 2010 it shelled South Korea's Yeonpyeong island, causing four deaths. The jointly run Kaesong industrial park is still in operation.